A number of different facilities come together in The Showroom. Whether you want to have a go at a new sport or develop a skill, book a birthday party, hire a meeting room, grab a coffee, or just have fun with friends, we’ve got something for everyone. Our events for young people will balance healthy competition with team spirit and support. Come join in and give your health, confidence and social circle a boost. We hope to develop activities for disabled participants using the sports cage and the climbing wall. We have a ‘Changing Places’ facility, ensuring that our centre is accessible and comfortable for all. 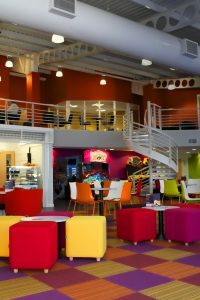 The main room features a great space for activities to be run as well as including; multiple arcade games, a pool table and an air hockey table. There is also a Diner onsite providing snacks, some hot meal options and treats at pocket money prices. Our party room is kitted out with audio and lighting equipment, bringing a massive party atmosphere to The Showroom. 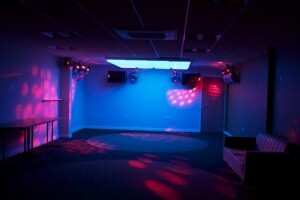 We’ll be running events using the party room, and it will also be available as part of our birthday party packages. Whether you need it for a disco, or birthday tea, this private space will be just what you’re looking for. Health and fitness facilities now on site! In 2018 with the closure of the YMCA St Rumbold Street Gymnasium The Showroom inherited a lot of gym equipment and opened the Fitness Centre. 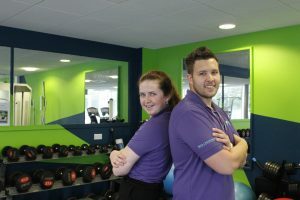 Activity staff have been provided with fitness training qualifications and are now able to run timetabled sessions in the Fitness Centre for Young People. Please see our Clubs and Activities Timetable for more information on these sessions. Perfect for practising with your football or hockey team or hiring for a fun-filled sport themed birthday party, there’s no excuse for not keeping active in the Showroom! We will be putting on a range of sporting activities for you to to take part in using the sports cage. Like everything at the Showroom, it’s your space, so if you have an idea or want to see an activity going on, then suggest it to the Showroom staff and we might just be playing your game very soon.